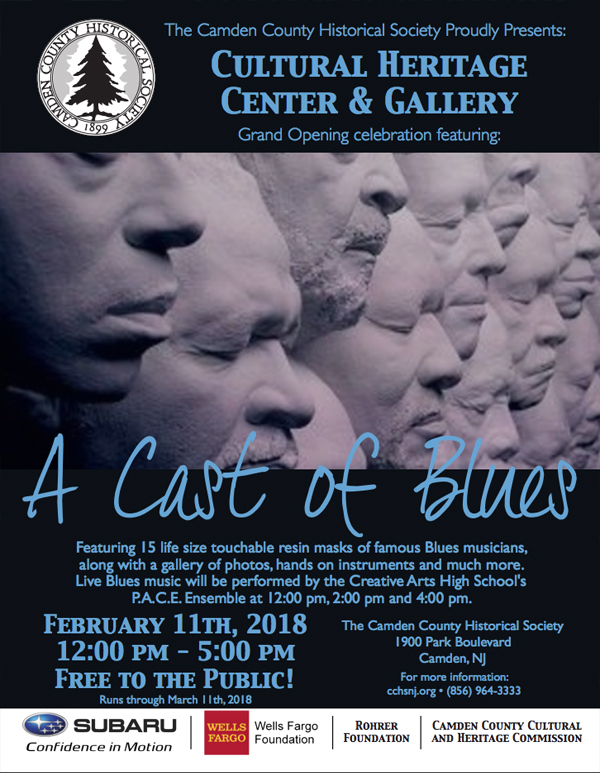 On Sunday, February 11th, the Camden County Historical Society will present a new exhibit A Cast of Blues at the grand opening of the Cultural Heritage Center & Gallery from 12-5pm. The free exhibit features life size touchable resin masks of famous Blues musicians, and live Blues music by Creative Arts High School’s P.A.C.E. Ensemble will be performed at 12pm, 2pm, and 4pm. This traveling exhibit comes by way of Kansas City, Missouri, from the Mid-America Arts Alliance and the National Endowment for the Arts. Blues music was born in Mississippi, came of age in Chicago, and went on to inspire generations of rock and rollers, ranging from the British invasion of The Beatles and The Rolling Stones to contemporary groups, such as The Black Keys. As one of America’s contributions to the world of music, the blues took root in the fertile soil of the Mississippi Delta, a flood plain covering 7,000 square miles between the Mississippi and Yazoo rivers. Early blues greats in the Delta pioneered the strong rhythmic style of music, accenting the raw emotions of the lyrics by squeezing chords out of a guitar with a bottleneck or metal slide. A celebration of Mississippi’s rich musical heritage, A Cast of Blues features 15 resin-cast masks of blues legends created by artist Sharon McConnell-Dickerson. In addition, the exhibition includes 15 color photographs of blues artists and the colorful juke joints in which they played. The images are selected from acclaimed photographer Ken Murphy’s groundbreaking book, Mississippi: State of Blues. The masks and images in A Cast of Blues tell the story of the hopes, sorrows, and triumphs of the men and women who lived and breathed the blues in Mississippi. The exhibition is fully accessible to all visitors, featuring braille labels, educational materials, and hands on instruments. In addition, visitors are encouraged to touch the resin-cast masks. A Cast of Blues is curated by Chuck Haddix, music historian, author, radio personality, and Director of the Marr Sound Archives at the University of Missouri-Kansas City. Also open on Sunday, February 11th will be the new African American History Room. Recently opened as the Camden County Historical Society’s permanent exhibit space for local African American History, the room features a timeline of African American history and a special exhibit on The Moores of Greenland (present day Magnolia, NJ). The exhibit runs through March 11th, with live music each Sunday at 12pm and 2pm on February 18th, February 25th, March 4th, and March 11th. Regular visiting hours are Wednesday, Thursday, and Friday from 10am to 4:30pm and Sunday 12-3pm. The exhibit is sponsored by the Subaru Foundation, the Wells Fargo Regional Foundation, the Rohrer Foundation, and the Camden County Cultural & Heritage Commission. The Camden County Historical Society is located at 1900 Park Boulevard, Camden NJ 08103. The site includes a research library in addition to Historic Pomona Hall and the Camden County Museum. Although the research library and museum will be closed for the Grand Opening event on February 11th, they are regularly open Wednesday to Friday from 10am to 4:30pm and Sunday 12-3pm, with a $5 admission fee for nonmembers. For more information, please call 856-964-3333, email admin@cchsnj.org, or visit our website at www.cchsnj.org.